Enjoy our Open Coal Fire on these cold evenings! 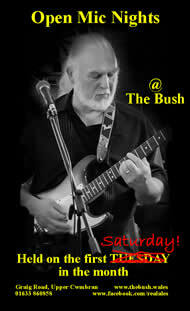 Monday evening will see us enjoying the usual Acoustic Jam Session from about 7pm. Open Mic Nights will now be on SATURDAYS!! Our popular Open Mic Nights have been run here over a number of years by Adrian Bold and have a well deserved reputation for being both "open", and all inclusive. 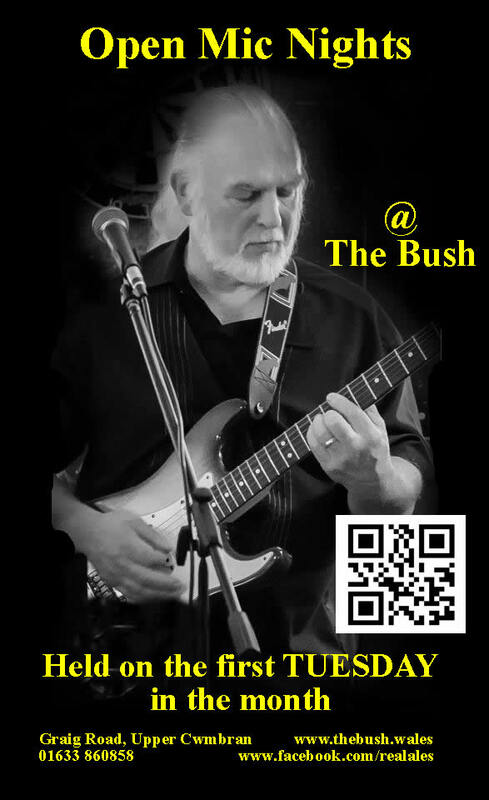 Unlike many open mic nights that end up with a few people hogging most of the time available, performers and potential performers know that at The Bush, under Adrian's direction, each and every one of them will have a fair opportunity to perform. Whatever your style please come along as early as you can and please make yourself known to Adrian who will ensure that you get the audience time you need! However it is increasingly clear that some of our Friday band nights audience are not very interested in the open mic nights. Similarly the open mic night regulars, many of them being performers, are not, in general, followers of our band nights. 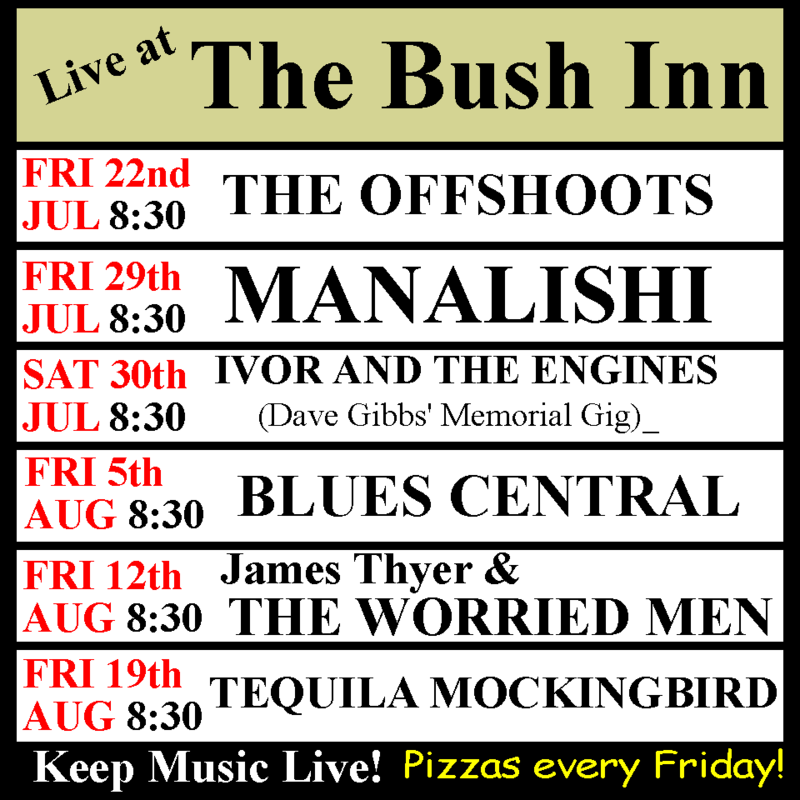 We have also had requests off open mic regulars to have a fixed day, say each month, when they know it will be open mic at The Bush. PLEASE NOTE From May 2018 until further notice OPEN MIC Nights will be held on the first SATURDAY of each month! Adrian Bold will continue to lead the Open Mic Nights! Adrian and I look forward to seeing all our old regulars on these Saturday nights and we welcome your comments on these changes. PIZZAS AVAILABLE, hand made and stone baked, arguably the best around, from 6:15 to 9pm. Friday 18th January "String Theory"
Friday 25th January "The Rhythm Method"
Friday 1st February "The Pieces of Mind"
Friday 8th February "Jamie Thyer and The Worried Men"
Friday 15th February "Big Sky"
Friday 22nd February "The Bus Pass Band"
Friday 1st March "Blues Central"
Friday 15th March "Blueberry Haze"
Friday 22nd March "The Blues Sisters"
Friday 29th March "Tequila Mockingbird"
Friday 5th April "Jack The Biscuit"
Friday 12th April "String Theory"
Friday 19th April "The Bushwackers"
Friday 3rd May "Bus Pass"
Friday 10th May "Highway 49"
Friday 17th May "The Jedis"
Friday 24th May "Tequila Mockingbird"
Friday 7th June "Stoney Broke"
Friday 21st June "Summer Wine"
Friday 28th June "Jack The Biscuit"
Friday 5th July "Barley Mow"
Friday 12th July "String Theory"
Friday 2nd August "Blueberry Haze"
Friday 9th August "The Worried Men"
Friday 16th August "Highway 49"
Friday 23rd August "Big Sky"
Friday 30th August "Tequila Mockingbird"
Why not come early on Fridays and enjoy one of our renowned hand-made stone-baked pizzas with a pint of real ale? (Book Pizzas if you want to be sure) Pizzas from 6:30 to 9:30pm Tuesday and Friday evenings, takeaways welcome! Acoustic Jam Session. Every Monday from about 8pm. Some good music is being played, why not come along and listen or join in, guitars and a Cajon available on loan. Maybe you can break the ice by performing here before coming to the next Open Mic Session? A good way to finish off the weekend? Curries every Wednesday. This is often a complete sellout, with most of our customers returning week after week. Booking advised (01633 483764). If you are fond of curries and you have not sampled our curries then maybe this week is your chance! Booking is advised but be warned; most customers are returning week after week. 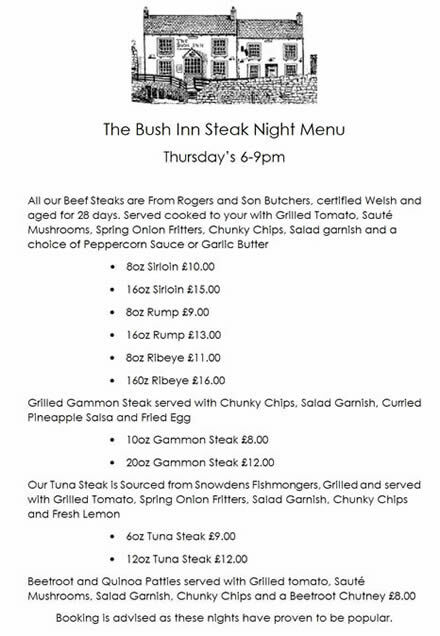 We have reason to believe that eating curries at The Bush could be habit forming! Further details below. Veg option to order only. Please phone. "Just returned from a superb curry at 'The Bush' Upper Cwmbran...Murg Xacutti...chicken with coconut in aniseed sauce....and Amras Ki Boti...Hyderabadi dish of lamb in mango. Half and half, with of course chips and naan...beautiful ! Well done to our Indian cuisine chef Mr Adrian Bold !...." 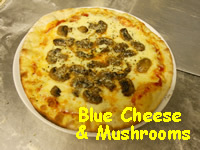 Our Pizzas are probably the best in the area, made using our own dough and hand produced. Sunday Quiz at The Bush! Popular quiz led by our very own Inn Quizitor, Nigel. Cash prizes and free raffle for a bottle of wine..
From 8pm (or earlier by request) GIANT JENGA! Available other times. We are one of the last proper pubs in the area. We are doing more good food but we do not want food to dominate the pub. Real Ales are our specialty (we are in The Good Beer Guide 2014 and 2015) and we usually have two available, we also have a good reputation for our Guinness (Quality Approved 2014). We have an increasing collection of single malts for the connoisseur and we offer excellent ciders (including local ciders) and lagers, and fine wines by the bottle (187ml or 70cl) and our selected house wines "Le Buisson", by the glass or bottle. See Facebook for more details on all events. Why not join our mailing list (link above) or like our facebook page, to keep up to date with what is happening at THE BUSH?